Subtle vanilla and chicory aromas give way to roasty flavors that highlight the dark malts in the beer. Brewed with beech wood-smoked malt and aged on French Oak, this old world lager will keep you humming that familiar tune. 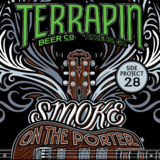 Like music to your ears, “Smoke on the Porter” is that song you just can’t seem to get out of your head. Brewed with beech wood-smoked malt and aged on French Oak, this old world lager will keep you humming that familiar tune.